Now HERE’S a nice looking man! 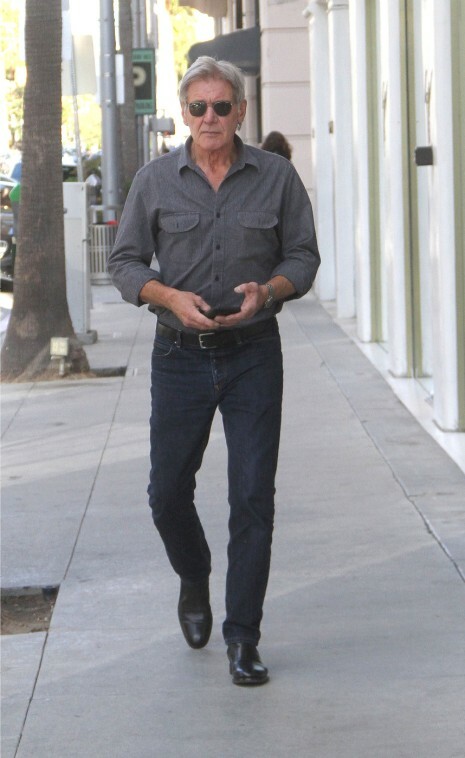 Harrison Ford, 73, is walking down the street in Beverly Hills and he looks better than most men HALF his age – or less. No baseball cap, no gigantic t-shirt, no cargo shorts, and NO flip flops! Without even trying, he’s probably Best Dressed man of the month! We’re guessing Calista Flockhart has a lot to do with his appearance. Harrison’s Star Wars movie is debuting with considerable fanfare, next month. He is a geezer. Money won’t help him. Looks like he still has that dumb earring. He stays in shape by carrying around his enormous ego. There’s not a damned thing wrong with cargo shorts! But then that comment is from a woman that constantly rags on other women’s looks. I agree Janet, Americans dress like complete slobs. Cargo shorts and flip flops are for the beach!